Hwang Sok-yong’s At Dusk (translated by Sora Kim-Russell, review copy courtesy of Scribe Publications) is the story of Park Minwoo, a successful architect living in Seoul. After a talk he gives in the city, a young woman comes up and thrusts a piece of paper at him before disappearing into the crowd. Written on the paper are a phone number and a name, Cha Soona, and this is all it takes for the sophisticated urbanite to be swept back to his humble beginnings. The reader is also taken several decades into the past, as Park reminisces about his childhood. One of the many families eking out a living on the outskirts of the city, living in a cramped shack with no running water, the boy and his parents do their best to get by with the help of their fish-cake stall. The young Minwoo shows an aptitude for study, and it’s this that links him to Soona, the only other student in the area. Looking back, he can’t help but wonder what happened to her, and his decision to get in touch leads him to reflect on his life, and on what he’s gained and lost. Hwang is a wonderful writer, and this third book in collaboration with Scribe and Kim-Russell (after Princess Bari and Familiar Things) is another well-crafted, entertaining read. What makes it a slightly different reading experience, though, is that At Dusk eschews some of the more fantastic elements of Hwang’s other work. There’s no talking dog or ominous dreams, no floating blue lights indicating the dokkaebi of the Seoul rubbish tips. Instead, what we get is a measured, sober tale of people doing their best to get by in an unforgiving modern society. As I lie in bed,looking up at that stain spreading across the wall, I suddenly feel breathless, like I am suffocating, and fight the urge to scream hysterically, But at least now the air is dry, so it will be liveable for the next few months. I look around at my room anew. One mattress, a sink, a gas stovetop, a microwave, a small refrigerator, a washing machine inside the dark utility closet, a cheap desk and chair, a wardrobe, and two fluorescent lights, one in the middle of the room and one over the sink. That’s everything. Her lifestyle is described as fairly typical of a young person in modern Seoul, and the reader is tempted to wonder just how much progress has been made since the times when families lived in slum shantytowns on the urban fringe. The slums Minwoo remembers from his childhood may well have been awful, with a fair amount of senseless violence and awful living conditions. However, there was still a sense of community and belonging (I’ve just finished watching the excellent Korean drama series Reply 1988, and while the homes there weren’t quite as poor, the tightly-knit community reminded me of the one depicted here). When we look at modern life through Woohee’s eyes, though, it’s a very different story. With no time for anything but work and sleep, she lives a rather lonely life, and if it weren’t for the help of her friend (another Minwoo), she would probably have gone under long ago. Even if the country as a whole has advanced immeasurably, it’s questionable whether her living standard is any better than that of the slum dwellers of the 1970s. 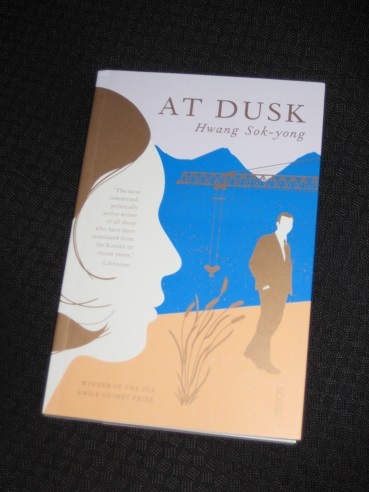 At Dusk provides the reader with an excellent picture of Seoul now and several decades ago, with a mournful, nostalgic feel pervading the novel. Without the usual magical elements, it can feel a little straight and serious at times, and for much of the novel you may be wondering exactly what the connection is between the two strands. However, Hwang is a masterful storyteller, and the final third of the book skilfully brings the disparate stories together, with a clever, and surprising, twist to round matters off. As mentioned above, this is Kim-Russell’s third translation of Hwang’s work, and there’s certainly a sense of a familiarity and comfort with the writer’s voice. In particular, there’s a definite similarity in terms of content with Familiar Things, and together they make for an excellent look at the price we pay for a convenient modern life. These offerings from Scribe have all been wonderful, but there’s still more in Korean that could be translated. Here’s hoping that they’ll continue to work with Hwang and Kim-Russell to bring more of his books into English in the future. The book seems to be saying that things were tough then and tough now for young people on low incomes, just in somewhat different ways. And Park Minwoo feels responsible for the decline of one of the positives from his childhood, the sense of community, because of the way the slum clearances were done. But that was a common problem with slum clearances all over the world in the second half of the 20th century, that communities were often broken up. Not as much is made of his sense of guilt as the blurb implied – more of the novel is about reminiscence. Though I read the “senseless violence” more like “scenes from old martial arts films”.